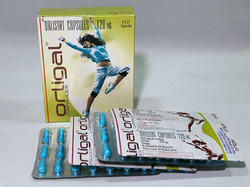 Leading Wholesale Distributor of orlistat 120mg capsules and tosiban from Chennai. 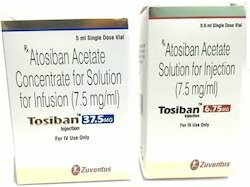 Atosiban ( Inj Tosiban 6.75 mg & 37.5 mg) by Zuventus is an inhibitor of the hormones oxytocin and vasopressin. Atosiban is used as an intravenous medication as a labour repressant (tocolytic) to halt premature labor. Atosiban is a nonapeptide, desamino-oxytocin analogue, and a competitive vasopressin/oxytocin receptor antagonist (VOTra). Atosiban inhibits the oxytocin-mediated release of inositol trisphosphate from the myometrial cell membrane. As a result, there is reduced release of intracellular, stored calcium from the sarcoplasmic reticulum of myometrial cells, and reduced influx of Ca2+ from the extracellular space through voltage gated channels. Looking for Weight Loss Medicine ?